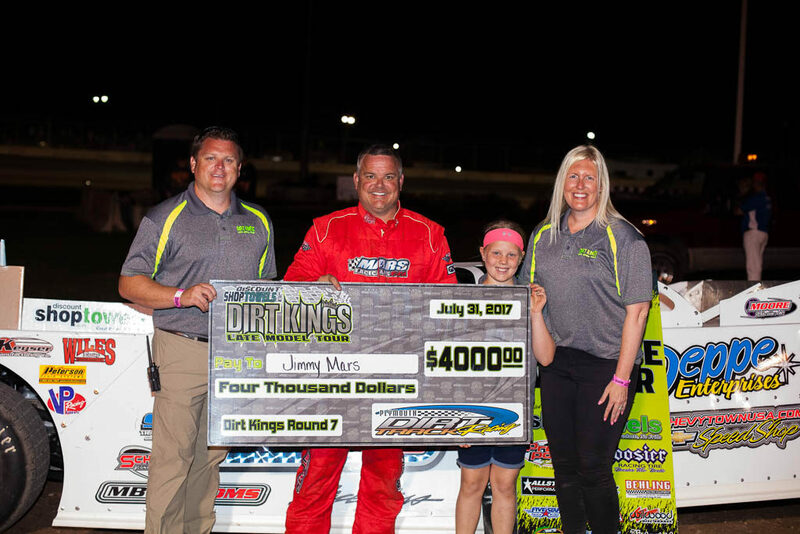 Jimmy Mars wins #round7 of the DiscountShopTowels.com Dirt Kings Late Model Tour at Plymouth Dirt Track Racing. Mars started the 50-lap A-Main outside row 2, while Jason Feger took the early lead. Feger and Brian Shirley battled for the lead in the early laps, but in a three-wide battle on lap 19, Mars ascended to the lead. Mars and Feger exchanged the lead five different times, as Shirley continued to battle with them, with point leader Nick Anvelink in fourth. Mars took the lead back from Feger on lap 35, leading the final 16 laps enroute to a $4000 payday. Shirley finished 1.46 seconds behind Mars in second position, followed by Feger, Anvelink and Tyler Erb in fifth. All but one car finished the 50-lap race - with no cautions to slow the event. Special Thanks to Miller Electric Welders for providing a Millermatic 125 to Brian Shirley, the fast qualifier with a 14.675 second lap. P6: 21 - Billy Moyer Sr.